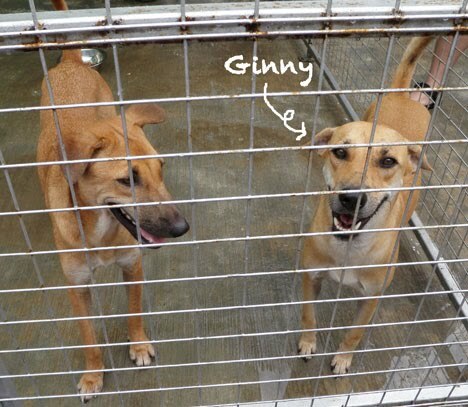 Ever since Ginny was redeemed from AVA and put in the shelter, no one had time to bring her to the vet yet. AVA also needs certification from the vet that she's been sterilized. So we made an appointment with our usual vet to see Ginny. This is our first time bringing a stray to the vet. 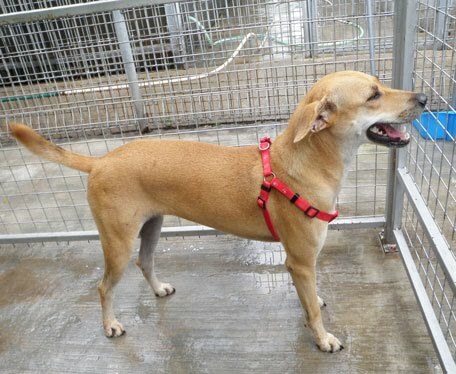 At the kennel, Ginny greeted us with her friendly smile and wagging tail. She looked happy to see us although my fellow feeder told us that she's been whining and crying everyday because she misses her 'master' from the construction site. She also hasn't been eating well because she's not used to eating knibbles. We put Cookie's harness on her and it fitted perfectly. Cookie is probably too fat to wear this harness now. We had a bit of challenge trying to get Ginny into our car. She just wouldn't go in. Perhaps a car reminds her of the AVA vehicle. Once in, she panted heavily. Vincent said that's probably because she was anxious and scared, but it didn't show on her face. Ginny made a big entrance at the vet. She was scared and pooped right at the main door. But after we went in, she wagged her tail upon seeing her same kind and lay down on four paws sniffing all the scents on the registration counter and on the floor (her tail was continuously wagging). I noticed that she's super friendly with dogs, strangers and even rabbits. I observed for a while for her tail wagging pattern. She would wag her tail seeing any of these living things passing by. Such a sweet girl. She will be great in family with existing pets. The vet estimated that she's only 2 years young. 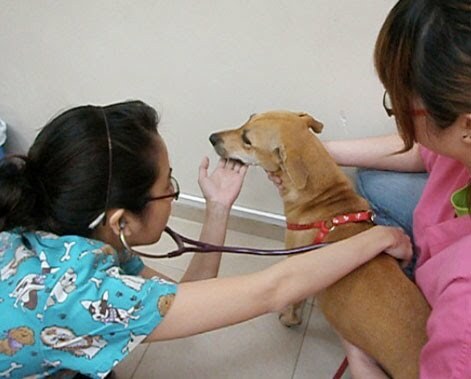 "She has nice skin, her fur is so soft," the vet commented. She's heartworm negative and given a clean bill of health! It's quite easy to handle Ginny. Although she's quite scared, Ginny let us do whatever we need to do with her, and she just took it in her stride. She only whined one when the vet gave her 3 jabs. After hearing Ginny's story, the vet brought out some knibbles to give her a treat. But Ginny didn't take any. 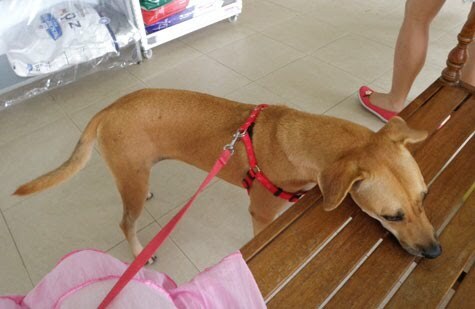 The vet helped us to administer the yucky smelling deworming tablets to Ginny. To our surprise, Ginny wagged her tail after swallowing it - watch the video below! I can't say Ginny enjoyed the outing to the vet. But I'm amazed that throughout the whole experience, Ginny didn't bark at all. 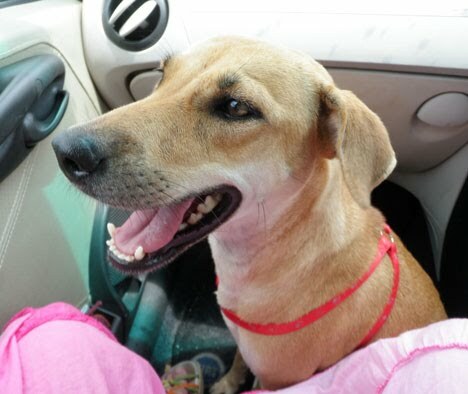 In fact, we have never heard her barking before even during her days as a carefree stray. In our car ride home, she climbed on the car seat and leaned on me to watch the scenery. She's so gentle, sweet, and friendly. 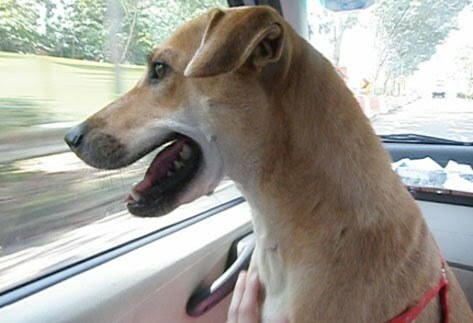 Hang on there Ginny, we will do our best to find you a home.